The room was very comfortable and clean. Equipped with TV, AC, electrical heater. There was everything I needed, and even more: such as snacks on the table and a bottle of water in the fridge and lovely Christmas decoration. Although I didn't meet them often due to my busy daily schedule (I went to Chios to volunteer for refugees) the owners are very kind and helpful. Location is nice, less than 10 walking minutes from city center, in a quiet street and with seaview! Quiet location by the sea/end of fortress walls. View of fishing boats and fish market/fish Taverna but no disturbance from them. Everything you could need in the studio and more, with spare towels and bedding. Slept well in the firm but comfy bed. Air con was good and there was also a fan if needed. Owner and family very nice and friendly and received a lovely mastic gift upon leaving. Appreciated early check in as we had arrived after an overnight sailing from Piraeus. Location was great, the room was very clean when we arrived, the owners/staff were very friendly and gave us a small gift when we left. The room was spacious. Facilities were fine, a washing machine was also available. It was nice to always have parking in a city that parking is a problem. Near by center and everywhere. Quite, comfortable and safe property. at the end of side street so quite quiet (but be aware that whilst we were there a large area at the side had been ashphalted so could be a car park or even a road.) ,but no bars/shops/mini markets nearby. The taverna shown in the picture was the only place we could get a drink .studio was well equipped -almost too much as it was a bit cluttered but there were several omissions from the advertised list .good bathroom. Great Hospitality. Before we left they give us some local presents as gift. Very kind people. The room was clean and comfortable. The atmosphere was nice and warm. The host very friendly and nice. the location was wonderful. We enjoyed the view of the sea and the closeness to town center and the castro. 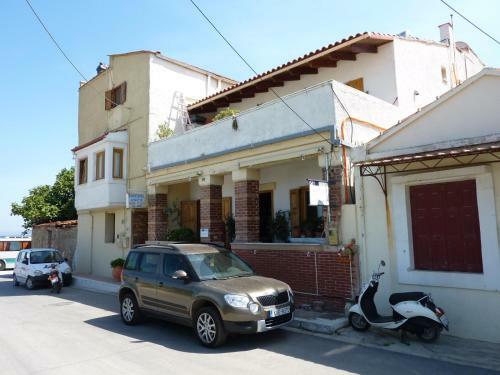 Everything was great as always :-) nice and comfortable apartment in quiet neighborhood near centre of Chios Town! Lock in a great price for Chios Town Studios – rated 8.8 by recent guests! Offering accommodations with air conditioning, Chios Town Studios is set in Chios, 2,650 feet from Port of Chios. Archaeological Museum Of Chios is 0.7 mi from the property. All units include a TV. There is also a kitchenette, fitted with an oven and refrigerator. Towels and bed linen are available. Chios Town Studios also includes a terrace. Byzantine Museum of Chios is 1,950 feet from Chios Town Studios. The nearest airport is Chios National Airport, 2.2 mi from Chios Town Studios. When would you like to stay at Chios Town Studios? This studio has a stovetop, washing machine and seating area. An extra bed is available at the interconnecting room with mini-bar, TV and private bathroom. ΤΟ ΚΑΤΑΛΥΜΜΑ ΕΙΝΑΙ ΟΙΚΟΓΕΝΕΙΑΚΗ ΕΠΙΧΕΙΡΗΣΗ ΚΑΙ ΕΙΝΑΙ ΕΝΑ ΜΕΓΑΛΟ ΣΠΙΤΙ ΣΤΟ ΟΠΟΙΟ ΚΑΤΟΙΚΕΙ ΚΑΙ Ο ΙΔΙΟΚΤΗΤΗΣ ΜΕ 2 ΑΝΕΞΑΡΤΗΤΑ ΣΤΟΥΝΤΙΟ 30 Τ.Μ. ΣΤΟΝ ΠΡΩΤΟ ΟΡΟΦΟ & 40 Τ.Μ. ΣΤΟΝ ΔΕΥΤΕΡΟ ΟΡΟΦΟ ΑΝΤΙΣΤΟΙΧΑ. ΟΙΚΟΓΕΝΕΙΑ ΒΑΣΙΛΕΙΟΥ ΚΑΡΟΥΣΑΚΗ. ΤΑ ΠΑΙΔΙΑ ΜΟΥ ΕΙΝΑΙ ΑΡΧΙΤΕΚΤΟΝΕΣ ΚΑΙ ΜΕ ΒΟΗΘΟΥΝ ΣΤΗΝ ΑΝΑΚΑΙΝΗΣΗ ΤΟΥ. ΕΙΝΑΙ ΣΕ ΠΑΡΟΔΟ ΚΑΙ ΟΧΙ ΣΕ ΚΕΝΤΡΙΚΟ ΔΡΟΜΟ! ΕΙΝΑΙ ΠΕΝΤΕ ΛΕΠΤΑ ΜΕ ΤΑ ΠΟΔΙΑ ΑΠΟ ΤΟ ΚΑΣΤΡΟ ΧΙΟΥ ΤΟ ΚΕΝΤΡΟ ΚΑΙ ΤΟ ΛΙΜΑΝΙ. ΕΧΕΙ ΘΕΑ ΣΤΗ ΘΑΛΑΣΣΑ ΚΑΙ ΑΜΕΣΗ ΠΡΟΣΒΑΣΗ ΣΕ ΑΥΤΗ. ΕΧΕΙ ΚΟΙΝΟΧΡΗΣΤΟ ΠΑΡΚΙΝΓΚ ΑΚΡΙΒΩΣ ΑΠΕΝΑΝΤΙ ΑΠΟ ΤΟ ΚΑΤΑΛΥΜΜΑ. House Rules Chios Town Studios takes special requests – add in the next step! Please inform Chios Town Studios of your expected arrival time in advance. You can use the Special Requests box when booking, or contact the property directly using the contact details in your confirmation. The bathroom was nice and modern, but was a bit too humid and shower curtain didn't cover the shower properly. But this was a very minor discomofort. Cleaning took place on Friday after our arrival Tuesday. We weren’t aware if/when it would happen. Cleaning materials/bin bags all provided so we were able to take rubbish out ourselves. A bathroom bin with a lid would be preferred given Greek plumbing arrangements. The room was cleaned once during our stay. It was not very convenient without a balcony as you had to go to the terrace to hang the clothes to dry. The only windows of the room were place in a way that they did not provide ventilation and light. A/C and fan were of course available. 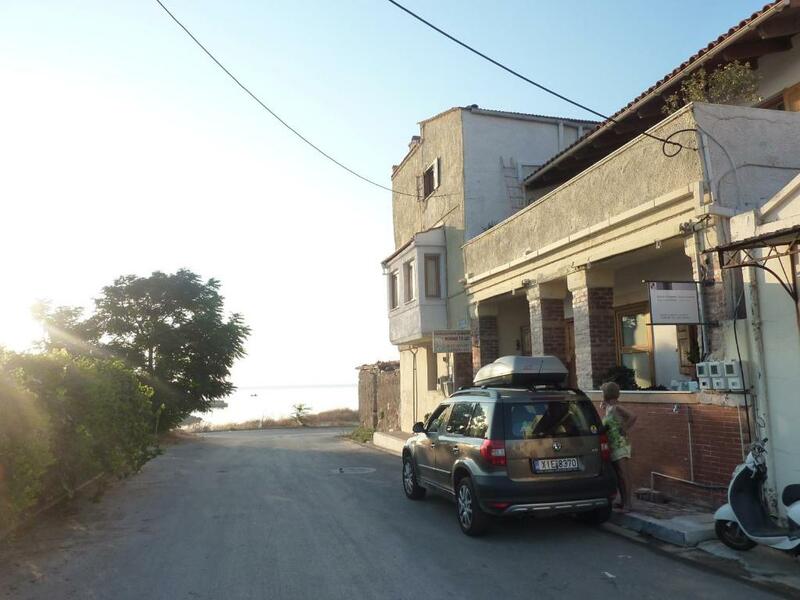 Building as advertised was NOT Chios Town Studios but a nearby taverna. Description said had patio but there was no direct access from the studio to any outside space whatsoever . Only cleaned and beds made on 4th day when bedding and towels changed ,and bins in both kitchen and toilet only changed that day. There were 4 different floor levels within the studio which did not help at night if you needed the toilet which was at the opposite end. Very hot , as air con was only in bedroom and most windows were on the corridor which composed remainder of studio . Very nice apartment with view and very kind owners! There were only some small details about comfort that made us think that it would be better, and I am sure that the concerned owners will take care of these as soon as they see it here: The door of the bathroom was very squeaky and it definitely needed to be oiled. The small and thin pillows that were used in the bed hardly supports the neck, so it may be better to use some pillows with more standard size and thickness. The place's location is perfect if you prefer a central place: It is right in the center and away from the city noise. If you plan to use public transportation, it is about 5 minutes walk to the Blue and Green City Busses' headquarters, It is 7 minutes walk to the main market area. The hosts are positive and generous. We felt ourselves definitely at home, as we were saying, "let's go back to home", instead of using the words "hotel", "studio" or "apartment". The inside of the building was cool, even at very high temperatures. This is definitely marvelous. We did not even need to use the air conditioner.